Battle Lines is, quite frankly, not a very good piece of television. Like a few of the episodes scattered throughout the first season of Star Trek: Deep Space Nine, it feels like it was pulled from a list of rejected scripts for Star Trek: The Next Generation. Ironically, it feels more like a reheated left-over than the next episode, The Storyteller, which was actually a recycled script from the first season of The Next Generation. Were it not for the involvement of Kai Opaka and a few hints about Bajoran spirituality, Battle Lines would feel almost as generic as The Passenger. The concept is fascinating, and it represents another long-term shift in Deep Space Nine, but the script from Hilary J. Bader feels too functional and broad to do the episode justice. Instead, it feels fairly bland, which is a bit disappointing for an episode where Sisko accidentally gets the pope caught up in the universe’s most deadly game of laser tag. War is hell. It’s a fairly common theme in media, quite popular in Star Trek as a whole and especially frequent within Deep Space Nine. 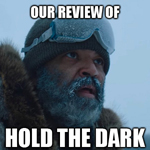 The problem is that the theme is generally dealt with in a manner a bit more nuanced and a little more sophisticated than it is in Battle Lines, which tries to make a broad statement about the horrors of warfare, only to feel a little too generic. Star Trek has always been fond of allegory, but the show works best when it’s able to foster an emotional connection, rather than dealing with issues completely in the abstract. 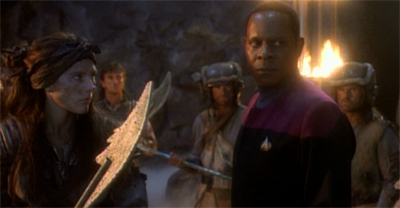 This strange war-world that Sisko and his team stumble across feels a little too simplistic. 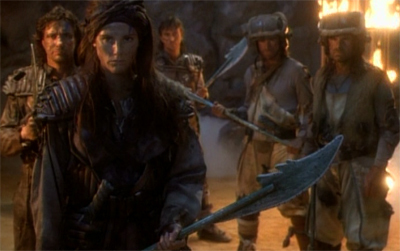 Inhabited by two sides – the “Ennis” and the “Nol-Ennis” – who are both suffering from “the punishment”, the planetoid here is a generic grey set with lots of dry ice. I remarked in my review of Vortex that I actually like the way the Gamma Quadrant has been portrayed as predominantly grey, but everything here seems a tad too generic. 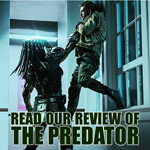 Quite frankly, it’s easy enough to see where the plot is going, and to grasp the moral before the story gets there. The characters are broad archetypes, so deeply invested in their eternal war that there’s absolutely no hope for them. Shel-La, the character with whom our leads have so much interaction, is completely committed to the slaughter of his adversaries. 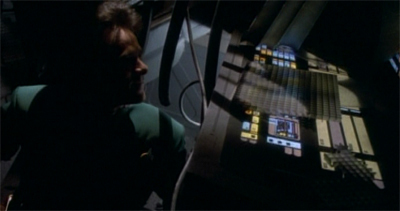 His last scene has the character ranting and raving about how – if Bashir can disable the nanites – it could give him the ultimate advantage over the Nol-Ennis. Again, this makes sense. If the show is about the nightmare of perpetual warfare, it needs to explore how those patterns of violence can become so deeply engrained in the individuals involved. However, it makes the entire scene ring false. Why would Shel-La organise the meeting if he felt this way? 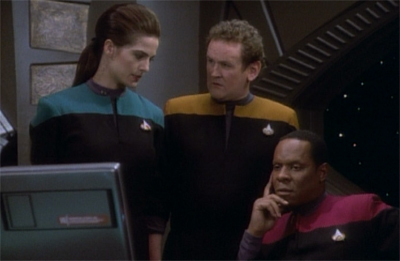 The fact that he seems to conceal some of his contempt for the enemy around Sisko would suggest he knows that he won’t get off the moon unless he plays nice. It seems like the episode does its best to present Shel-La as relatively reasonable until that point – giving the episode a nice twist – but it just rings false. However, there are some problems with even this basic concept. Apparently the original idea featured Cardassians and humans, and it was changed to two generic species so it would not look like Sisko had taken sides. It’s a fair point, but one senses that the reveal of how blood-thirsty Shel-La is might have worked better had he been human – forcing Sisko and Kira to reassess their preconceived notions and challenging the characters’ perspectives in a way that Deep Space Nine would do so well. The Next Generation would never call its leads out in a similar situation, but you sense the episode might have wrangled some drama from Sisko’s unspoken assumption that the humans would be the good guys. The episode therefore defines the two species relative to each other, where the Ennis are identified as themselves and the Nol-Ennis as those who are “not Ennis.” A smarter script would have probed the use of this language to define and classify opponents as “not-self”, so to speak. It might have been interesting, for example, to discover that “Nol” call themselves “Ennis” and believe that Shel-La leads the “Nol.” Even a clumsy use of “us” and “them” rhetoric might have been a smarter way to illustrate that the two sides are basically the same. The episode comes from a story by Hilary J. Bader, and it shares a lot of problems with her work inside and outside the franchise. Everything is so broad and generalised that there’s no real nuance. Attempts at characterisation are haphazardly inserted between high concepts that feel disengaged from the characters caught up in the drama. The central character work in Battle Lines concerns Kira, which isn’t a bad idea. Kira is, after all, a former terrorist. She knows quite a great deal about perpetual warfare and raw hatred. So this trip should resonate for her. And here there’s a sense that the writers are having a bit of trouble with Kira as a character, something which they would fix quite well in the later episodes of the first season. Duet and Progress both offer thoughtful explorations of Kira’s outlook and the difficulty reconciling her past with her present. One of the boldest statements about Kira – and something that no modern show would get away with when writing a lead character – is her confession in The Darkness and the Light that she feels no sorrow for her violence during the Occupation. That’s a gutsy position for a major character on a prime-time drama, and one which challenges the audience. Kira’s moral compass points in its own direction, and it doesn’t always align with traditional Star Trek values, but that is precisely what makes her such a compelling character. 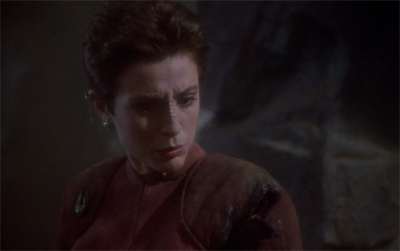 Battle Lines seems uncomfortable with that aspect of Kira, and it tries to present her as wracked with guilt for her actions during the Cardassian occupation. It feels a little too clear-cut, a very obvious attempt to make Kira conform to our expectations of what a former terrorist should feel, rather than something which feels organic for the character. Later interpretations, even during the first season, would back away from this take on the character. I’d argue that Kira was the stronger for it, and that even the show’s final season went to great pains to demonstrate that Kira is still a freedom fighter (and still a terrorist, depending on how you look at it), even if the situation has changed. All that said, it is nice to get a sense of Kira’s religious beliefs. Kira’s religion plays a part throughout the show’s run, but we never really get a look at how her faith in the prophets intersects with her actions during the Occupation. Star Trek never really gave us too much insight into the Bajoran belief system, but it is broadly linked with Buddhist religious philosophies – or at least, the kind of New Age version of Eastern philosophy that Hollywood traditionally associates with Buddhism. As Emily McAvan notes in The Postmodern Sacred: Popular Culture Spirituality in the Science Fiction, Fantasy and Urban Fantasy Genres, “Like many of the fictitious religions in the postmodern sacred, the Bajoran faith’s chief real-world referent is Buddhism, with Buddhist style robes, references to meditation and chanting.” There are hints of Christian themes to be found as well, but the Bajoran religion seems pacifistic. It is very hard to imagine a Bajoran version of the crusades, for example. Trying to reconcile her faith and religious morals with her own lack of guilt over her conduct feels like a much more compelling character hook than suggesting she is ashamed of her past. 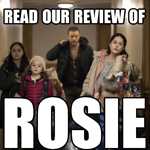 Making her ashamed and repentant makes it easier for the audience to like her, and makes it possible for us to brush aside the fact that she engaged in a terrorist campaign to free her homeland. 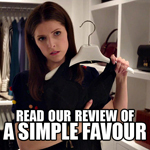 It tidies up the ethical issues in a way that makes them less interesting. 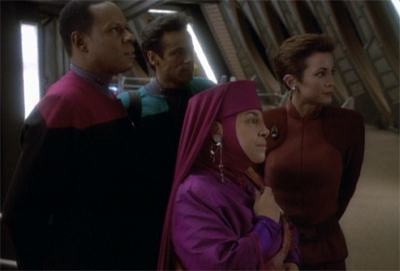 Of course, Battle Lines is probably most notable for its long-term contribution to the Deep Space Nine mythos. Discussing Vortex, I talked about the way that these episodes in the mid to late first season see the writers experimenting with long-form storytelling. There are plot points and ideas thrown out with the promise they will be further developed down the line. If Odo never discovers his people, Vortex loses a lot of its resonance. Here, the writers kill off Kai Opaka. 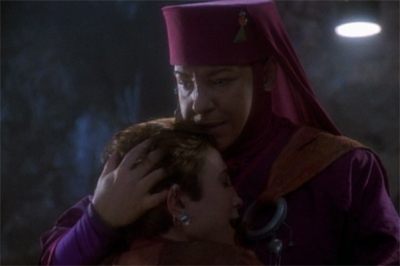 The leader of the Bajoran religion, Opaka’s death feels like a pretty big deal – despite the fact she only appeared briefly in Emissary. It’s hard to call her a member of the recurring cast, since she has only appeared once before, but we know that she’s important. She’s not some alien dignitary of the week. She’s the spiritual leader of that big planet sitting close enough to Deep Space Nine, and a vital part of the political framework of the society Sisko has been tasked with welcoming to the Federation. Note to self: next time a religious and spiritual leader asks you to take them into uncharted space, offer to show them the replimat instead. 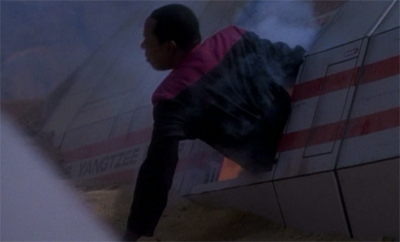 So getting her killed on her first trip to the station is probably not the best thing Sisko could have done. And yet, it’s a great idea. It’s easy to say that in hindsight, knowing that her death here makes In the Hands of the Prophets possible at the end of the season. However, even conceptually, removing Opaka from the board makes things more interesting. It was important that somebody welcome Sisko to Bajor, but it seems almost too easy if he has a leader who agrees and supports him. Taking away a friendly authority figure, setting up potential political problems with her successor and generally making Bajor more unstable, all makes Deep Space Nine more interesting. Of course, there’s also evidence that the writing staff haven’t quite got this whole long-term plotting thing yet, that they are still finding their way. Much like Vortex winds up being most irrelevant to Odo’s overarching character arc, Battle Lines seems to tease the return of Opaka at some hazy point in the future. (Much like Bajor’s entry into the Federation, this was one of the plot points left unresolved by the show, but picked up by the novel relaunch.) 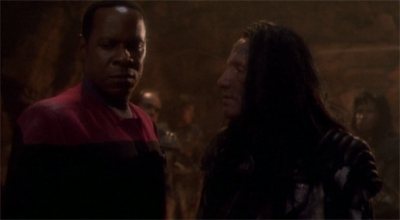 Indeed, the episode ends with Opaka promising, “My work is here now, Commander. But your pagh and mine will cross again.” Maybe just not in the next seven years. She is acting on instructions from the Prophets that she herself does not yet understand. The honour and devotion she is accorded by Kira reflect the role she has played in helping the Bajorans survive the Cardassian occupation. What she, and we, cannot know is that with the retreat of their enemy the Bajorans are poised on a new phase of their existence, and therefore a change in spiritual leadership is required. What is to become of a Kair who has outlived her purpose? The Prophets intend for her to find a new purpose elsewhere, and so she must enter the mysterious portal to emerge on the other side and crash-land on an unknown planet that has been designated a penal colony by an unknown species. Opaka dies during the incident, then is apparently resurrected. 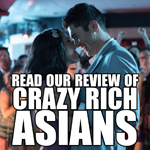 Unfortunately, the story and the script simply don’t make it work. He clarifies, “Anything that can be programmed can be reprogrammed. If I could disable the mechanism in these microbes, they should no longer function when someone is killed, and these people would finally be able to die.” That’s a nice hook, and it raises some interesting questions about the Hippocratic Oath. If a person lives in a perpetual state of agony, can helping them die ever be justified? Does ending somebody’s immortality count as murder, even if you don’t kill them yourself? Unfortunately, Bashir only remarks on this in the closing minutes of the episode, so it serves as a springboard to remind us that these people are crazy hate-filled monsters. It seems to exist purely so we don’t feel too bad about Sisko and his crew leaving the planet behind them. There are other small touches which don’t add up to anything. 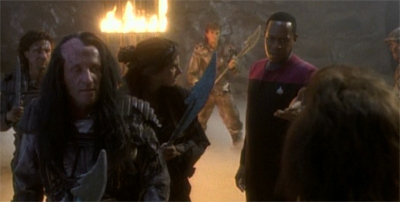 I like the continuing depiction of Bashir as a sort of boy scout, one unused to the ethical grey areas on the show. 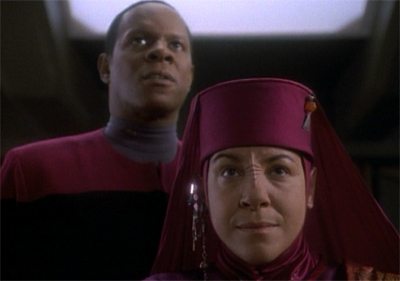 “I told them that we’d transport them off this moon,” Sisko remarks. Bashir, over-eager, replies, “Isn’t that a bit like assisting a jailbreak?” We get another firm reminder that Sisko doesn’t seem to like Bashir very much, as he informs Bashir, “I don’t need you to interpret the prime directive for me, Doctor.” It’s a small moment, and one lost amid the episode’s blandness, but it’s still an effective reminder of how well-formed this ensemble is, even at this point in the game. Runabout hulls are made out of metallic composites that interact with magnetic fields. We could send out a few probes to scan the system for those specific magnetic resonance patterns. If Sisko’s runabout is in the system, we might pick up a fluctuation in the hysteresis curve. The magnetic deflection of a runabout’s hull is extremely weak. The probes will never be able to detect it. They will, if I can outfit them with a differential magnetomer. A differential magnetomer? I’ve never heard of a differential magnetomer. How does it work? 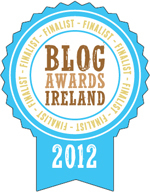 I’ll let you know as soon as I’ve finished making one. This time could have spent developing the Kai or the guest cast or on anything other than just padding. Battle Lines has some neat ideas, but the execution leaves a lot to be desired. A lot of it feels like a reheated left-over from the bin outside the writers’ room on The Next Generation. 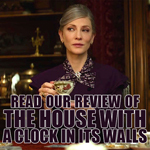 Still, despite the blandness of the episode itself, there’s a sense that the show isn’t just interested in week-to-week storytelling, and that there might – just might – be a long-term plan here. This episode resonated with me. 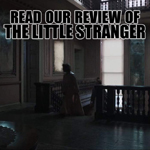 The story may have been too simply allegorical, but I think it was bold. Trying to reconcile her faith and religious morals with her own lack of guilt over her conduct feels like a much more compelling character hook than suggesting she is ashamed of her past. Very much so. I feel guilty that I don’t feel guilty, or even, I’m afraid that I am guilty regardless of what I may feel are very understandable thought processes, even if they might be slightly illogical. At least, I understand them, and I identified strongly with Kira. That’s a great thought! The episode would have been better if they had stuck to their original plan, having humans and Cardassians. It would have developed the continuity wonderfully, and the Bajoran kai being stranded among depraved Cardassians and humans would have been brilliantly symbolic. Siscko didn’t take sides. I can see that, and I do love a good Star Trek allegory – The Measure o a Man is among the very finest hours the franchise has ever produced. At the same time, I just didn’t respond to Battle Lines. It seemed rather… generic. But you’re right on the religion thing – I grew up as an Irish Catholic and it’s amazing how much guilt accrues with that. (At the same time, that Irish Catholicism is a major part of the Northern Republican movement (just as Protestantism is part of the Loyalist movement), for example, so it generates all manner of interesting philosophical constructs.) I guess what I’m trying to say, though, is that I like Kira better when she’s unrepentant, when she might harbour guilt or remorse, buried deep inside, but she doesn’t seek forgiveness for her actions. She wants inner peace, but the best portrayals of Kira make it clear that the inner peace is not driven by a desire to be forgiven for what she did. I think that Kira works best when her moral compass is just ever so slightly misaligned with viewers. I think that Kira works best when her moral compass is just ever so slightly misaligned with viewers. And maybe at least as importantly, when her moral compass is slightly misaligned with the Federation, but she ends up working with the Federation without necessarily respecting them as a higher morality. I think she respects the members of the Federation that she works with and comes to think of as close colleagues, but she never “converts” to Federation inclusivism. I grew up American Evangelical, and Kira’s emotional responses throughout the series seemed eerily relevant to my religious heritage and the beliefs I’ve always struggled with. In this episode, her demonstration of guilt in the presence of the Kai looks like a classic Evangelical altar call. It’s important to me that Kira’s guilt is never resolved. I think she can reconcile the tension between guilt and her own acceptance of her actions as a matter of faith. It’s a real shame that Jonathan Banks was given such a flimsy role. While bit parts like this ultimately contributed to his reputation to be cast in his breakout roles, I got the feeling he was giving his best to not just be the Stallone/Gibson facsimile the script asked him to be here. Another actor as Shee-la would turn a bad episode into a wretched one. I’ll have to disagree on that one. This episode concept has the distinct feel of a TOS episode, only held back by the DS9 trappings. Get rid of that DS9 grey and add some bright colors, get rid of Shel-La and replace the bland generic aliens we’ve never seen before with some humans from the past lead by F.D.R. in his wheelchair armed with a rocket launcher, and you have yourself an episode! Then it wouldn’t have seemed out of place when the main lead is stranded on the punishment planet with the space pope. 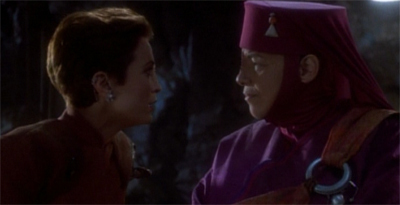 There’s also a Voyager-esque quality to the episode, where Sisko strands an alien spiritual leader (a character we barely knew) on a wacky planet; accidently gets her killed and makes her immortal at the same time, (either of which would have extreme ramifications to the Bajoran devout) and just leaves her stranded, never to see her or the planet again, and we barely see any ramifications. All this episode does is get rid of the current Kai, who seemed amiable and reasonable, and instead introduces forced and manufactured conflict in the form of Kai Winn, a more sociopathic version of Nurse Rachet (the show clearly lost in this trade). Winn manages to be more insufferable then Janice Lester from Turnabout Intruder “I feel your anger towards me, and I forgive you for it”. 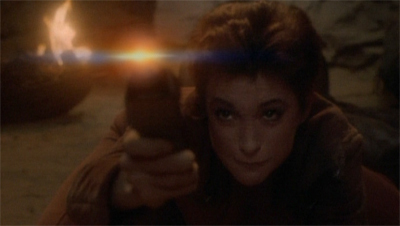 To put the Bajoran/Cardassian conflict in WWII terms, Kai Winn is like a Jewish Rabbi who condemns any Jews that resisted the Nazis, will try and assassinate fellow Jews to attain power, will side with the a extremist organization supplied by the Nazis to try and get rid of the Allies occupying the Jewish communities so that they would be defenseless again, and will eventually work with a Nazi concentration camp commandant to release demons unto the world with an evil book (and doing all this while maintaining popular support among her people). One struggles to wonder why Sisko, after any visit from Winn, doesn’t come back to this planet with thousands of scientists to try and get to old Kai back. I honestly prefer Voyager’s minor-conflict between the characters, then this irritating cartoon of a villain opposing the ensemble because the plot needs a villain, even Seska wasn’t this bad. At least Chaotica was fun to watch as a villain, but with Winn, as Sfdebris puts it in his latest Star Trek review, you just sort of wish Jack Nicholson would just come in and start strangling her. I really like Winn. She certainly seems more realistic than most Star Trek baddies, in terms of basic psychology; in that I’m fairly sure I’ve worked alongside several people who could empathise with her. And I think she’s arguably even more relevant today than when the show was broadcast.